Living Coasts - an all weather attraction. Located on Torquay seafront , where there’s plenty to see and do: mingle with the playful penguins, get up close to the otters, octopus and seals, and much more. Kents Cavern - prehistoric cave, home of ancient humans, award winning visitor attraction in Torquay - with tours, shop, cafe and visitor centre. We are a short stroll away is the beautiful Torre Abbey. It is a historic building and art gallery It was founded in 1196 as a monestary for Premonstratensian cannons and is now the best-preserved medieval monastery in Devon and Cornwall. In addition to its medieval and Georgian rooms, Torre Abbey is known for the formal gardens, for the third largest art collection in the county of Devon and for regular exhibitions by contemporary artists. A classic bus trip tour that is fun for the whole family, taking you to the stunning GreenWay House from Torquay. 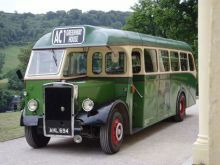 Travel back in time aboard 'Barnaby', a 1947 vintage bus that will take you on an authentic 'jiggle jerk' ride to Greenway, Agatha Christie's holiday home on the banks of the River Dart. You'll travel along the Agatha Christie Mile in Torquay and through beautiful South Devon lanes accompanied by an informative commentary from the jolly driver. Greenway, now owned by the National Trust, offers an extraordinary glimpse into the private life of the much-loved author and her family. Great fun and its only a short walk away at Torquay Harbourside. an all weather attraction, located on Torquay seafront in South Devon, where there’s plenty to see and do: mingle with the playful penguins, get up close to the otters, octopus and seals, and much more. Historic picture postcard Cockington Village which lies just off the seafront near Torquay. Enjoy a walk, a bite to eat and the sights of this wonderful place.